These colourful gemstone sweets are made from coconut water, fruit juice, agar agar and a natural sweetener. 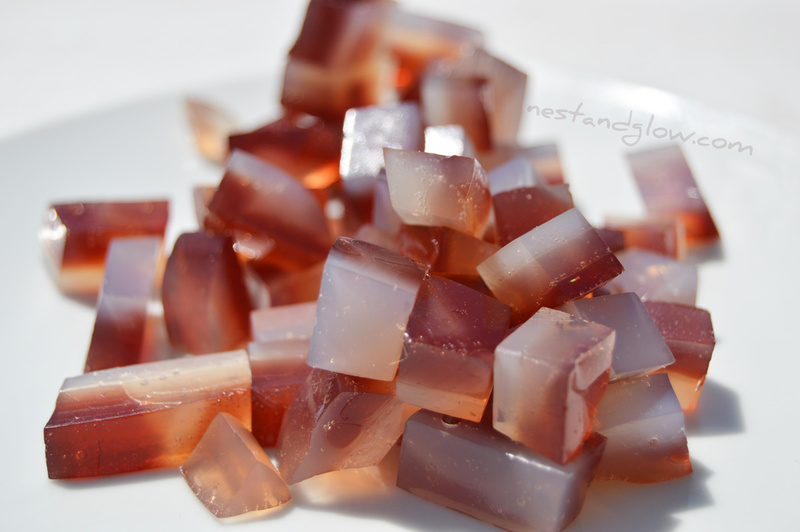 They are simple to make and set quickly to make a tasty and healthy natural jelly sweet. Suitable for vegan, refined sugar-free, plant-based and general natural healthy diets. 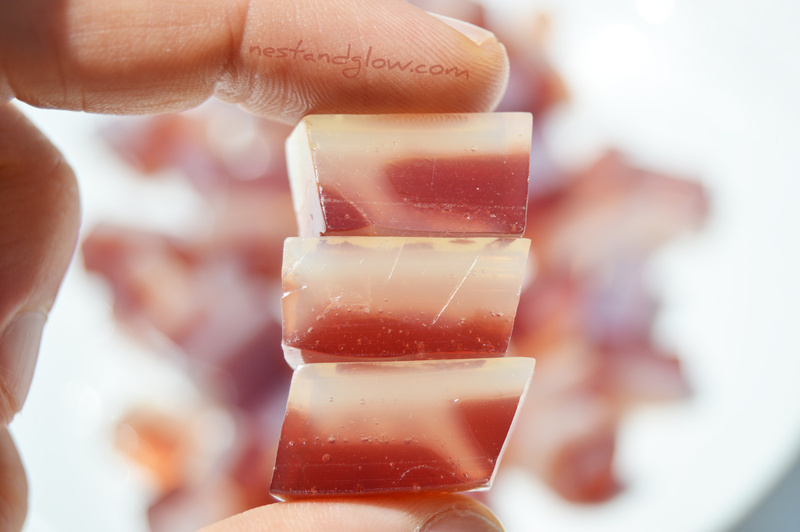 The magic ingredient is the natural seaweed extract agar agar. 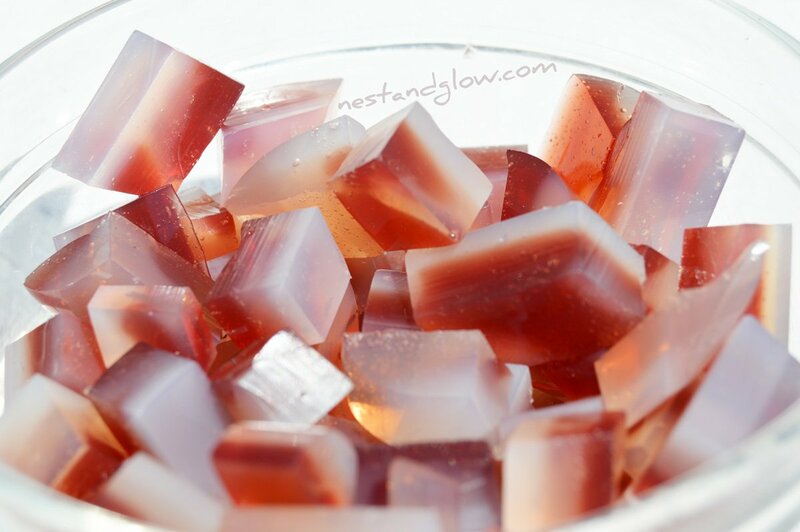 I used red grape juice to make these reddy pink gemstone sweets but you can use any fruit juice that you like. Freshly made juice and pure fruit juice works just as well for these. Do avoid using any “juice drinks” as these are not 100% pure fruit juice and won’t work as well. I’ve also made them with orange juice and purple grape juice and they looked and tasted just as good. Mix together the coconut water with half of the agar agar and sweetener. Bring to a simmer and stir constantly for 5 mins. Repeat steps 1 & 2 with the fruit juice in a separate pan. Pour 2/3rds of the coconut water mixture into a dish (6″x6″) in a bath of ice cold water. Leave to set for 2 mins. Mix together the remaining 1/3rd of coconut water mixture and 1/3rd of the fruit juice then pour into the dish. Leave to set for 2 mins. Pour the remaining fruit juice mixture on the dish. Then chill for 10 mins until set. Tip out onto a chopping board and chop lengthwise then into random shards. Store the sweets in the fridge and enjoy within 3 days. I’m using the sweetener xylitol as its white so won’t affect the colour of the coconut water and unlike most other sweeteners it is good for your teeth. Xylitol is a natural extract from birch tree sap and is an ingredient in many natural toothpaste and sweets. It’s sweeter than normal refined sugar but contains fewer calories. It has a slight endothermic reaction so has a cooling sensation in your mouth. The sweetener is optional but they can be a bit bland without it as coconut water has a mild taste. You can use any sweetner that you like, but if you do use a darker one like maple syrup then the resulting sweets will be a bit darker, but just as delicious. These sweets are a jelly type sweet thanks to the seaweed agar agar. This is the same ingredient that I use to make many vegan cheeses (like smoked cashew cheese) and a coconut milk panna cotta. I always use agar agar powder as it’s the most potent type. You can use the flakes and bars but you will need to experiment and add over double the amount of powder. Agar agar is also high in protein so these sweets also contain some plant based seaweed protein. 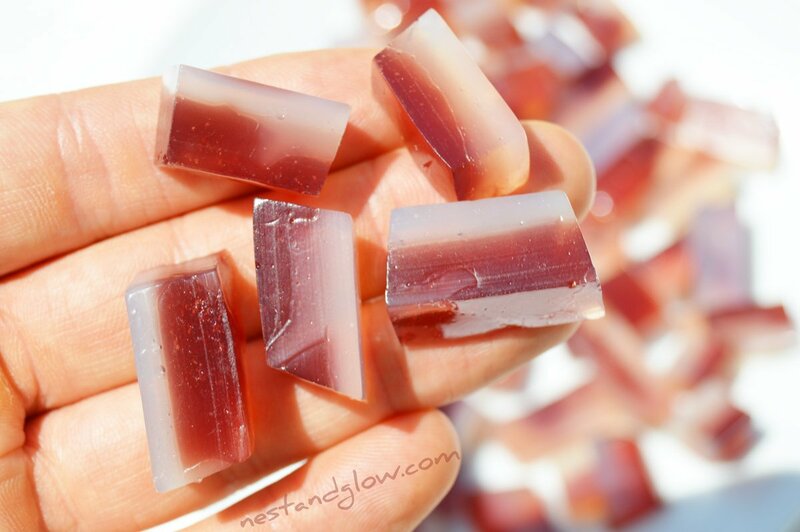 I was inspired to make this by seeing gemstone soap projects and from my reasearch, it looks like no one else has made gemstone sweets. 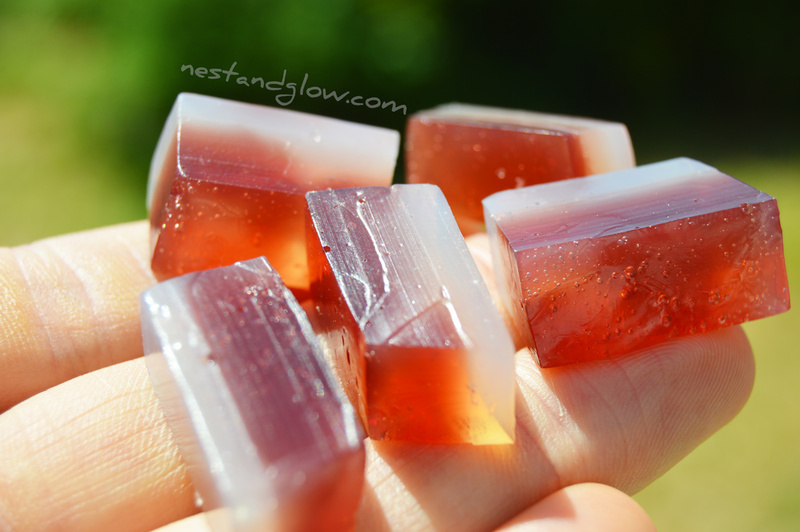 This recipe is pretty much the same as my fruit juice jelly sweets but in a different formation to give the gemstone look. The agar agar is the only compulsory ingredient in this recipe and it can’t be substituted. Even if you are not vegan / vegetarian agar agar is a nice product to use rather than gelatine and it’s very unpleasant smell. greetings from Pakistan. thank you for an amazing recipe! I used 1 tbsp plus 1 tsp agar agar (instead of 2 tbsp) and this came out perfect. I so dislike animal gelatin as it has horrible smell.